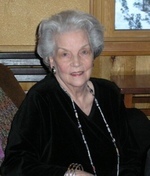 Marjorie Mae (Bobbie)Thrower Peek, 93, departed this life 12:45 a.m., April 10, 2019, in Franklin, Tennessee. Born January 29, 1926, in Guntersville, Ala., Bobbie was the daughter of Robert Floyd Thrower, Sr. and Bertha Cleland Thrower, long-time merchants in Arab, Ala. She graduated from Arab High School and attended Snead Junior College and Montevallo College and was graduated from Auburn University School of Education in 1949. At the age of 84, she led a Sanibel Island restaurant filled with Auburn fans in the Auburn Fight Song, a song she sang, along with many precious hymns, in the final days preceding her death. All her life, she began and ended each day with a song. Known for her distinctive elegant style, intelligence and fierce spirit, she was equally at ease at home putting up bread and butter pickles and joyfully singing gospel hymns and teaching and challenging students and working for causes she believed in. She was an inspiration in the classroom, directing school plays and coaching girls basketball at Union Grove Junior High School and teaching American history, typing and shorthand, at Arab High School, where she started a vocational work study program. Bobbie practiced her sparkling charm and salesmanship working in her father’s store, Thrower Dry Goods on Arab’s Main Street. In her later years, she gracefully ran a bed and breakfast with her husband and daughter, and just as gracefully, amazed her baseball-loving son-in-law with a few perfectly hit home runs. She spent the first 50 years of her life in Arab, where she met and married her husband, Woodrow Binford Peek Sr., a happy marriage of 59 years until his death in 2007. They raised two accomplished sons and a daughter in Arab, and were active members of the Arab Church of Christ. She spent her last 43 years in retirement in Nashville, Brevard and Hendersonville, N.C., and White Post, Virginia. She is survived by one son, Floyd Lamont Monty Peek (Leisa), her daughter Linda Peek Schacht, and daughter-in-law Cathy Peek, as well as five grandchildren, Leah Hitson, Callie Farro, and Tyler, Alex and Laura Peek, and seven great grandchildren. She was predeceased by her dearly loved husband Woodrow, son Woody Peek and son-in-law Mike Schacht. The family wishes to thank her many remarkable caregivers of the last eight years. Visitation will be 1-4 pm Saturday April 13, 2019 at Williamson Memorial Gardens, 3009 Columbia Avenue. Franklin, Tennessee. Celebration and memories of a life well-lived will be shared 2-2:30 pm. Funeral and Graveside Service 2 pm Sunday April 14, 2019 in Ruth, Alabama at the Mt. Oak Methodist Church with visitation one hour prior to service. Memorials may be made to the Mt. Oak Methodist Church in Ruth, AL. 3384 Ruth Road, Arab, Alabama 35055 and to Alzheimer’s Association, 478 Craighead Street Suite 200, Nashville, TN 37204 or donate online: www.act.alz.org. Proudly Serving the Communities of Franklin, Spring Hill, Middle Tennessee and Nationwide.